Fog, rain, and a 10% grade road winding like a rollercoaster through Killington's renowned ski town. The stage was set for the last World Cup of the 2017 IDF circuit and tensions are high. Although the season is coming to a close, there are still a number of ranking positions that could be changed with this last race of the year. Calvin Staub, Daina Banks, and Brennan Bast were looking quick during today's Freeride runs. Today kicked off practice and what started as a misty morning with a patchy covered track turned into a dry freeride day with perfect conditions to go fast. Riders had at least 11 practice runs throughout the day with practice timing starting on their second run. Aaron Hampshire from Colorado was steam rolling and set the fastest time of the day after his second practice run. These times are just for kicks and tomorrow will be the official qualifying day, however, you can view the full list of Freeride day times here and below. Not everyone wore their transponders on practice day but here are the times for the few that did. In our previous Killington post we described the ranking changes that are possible with the current points set up. Some of these points were dependent on the attendance of certain individuals and their performance at the race. Max Ballesteros leads a pack of Californians. 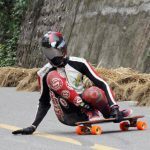 In the Open category, there are a number of top skateboarders in attendance that still have a chance at earning the World Champion spot for this year. Carlos Paixao (BR), Mitch Thompson (AU), Thiago Lessa, (BR), and Aaron Hampshire (US) are some of the top contenders racing whom could earn the world title. Taylor Cook, Adam Westfall, and Mitch Thompson dive into one of the fast top rights. This afternoon there was a casualty between Carlos Paixao, Emily Pross, and a number of other individuals in the fast left bridge corner towards the top of the hill. Both Carlos and Emily were transported to nearby hospitals but we are glad to hear that both are okay. Emily has a contusion to her hand and Carlos is receiving stitches in his foot. We are unsure how this may affect their performance at the race. Eyes in the Apex as Carlos dives into the left after the bridge. Emily Pross taking a film run (unrelated to the crash mentioned). Another potential change in the rankings is within the luge class as Ryan Farmer (US) and Abdil Mahdzan (MY) are both close in points for this year's world champion. 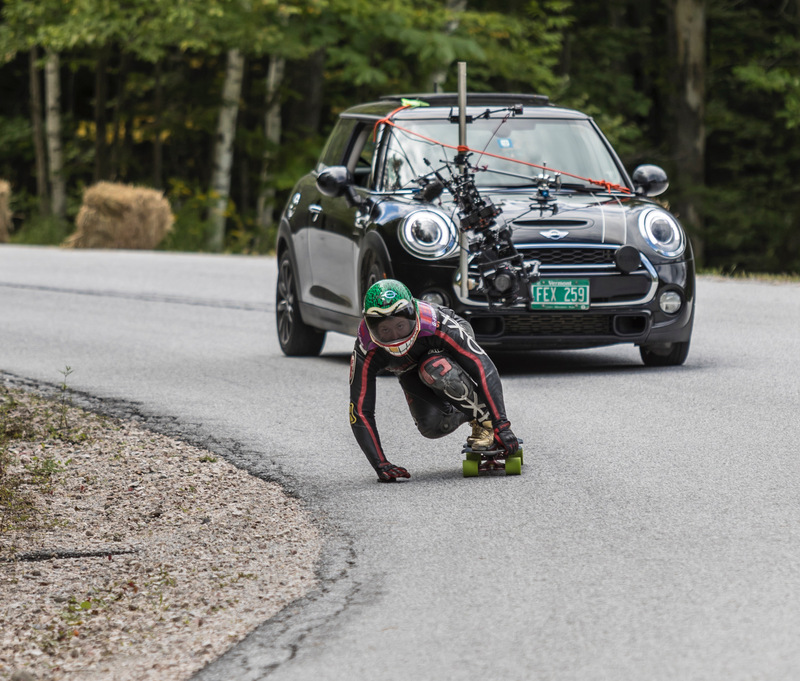 Abdil is not in attendance at this year's Killington race so Ryan has a chance at the top spot if and only if he wins the race this weekend. East coast local Kolby Parks is a veteran to the hill and is bound to give Ryan a run for his money. A pack of lugers enters the bridge left with Kolby Parks lurking on their tail. Qualifying runs will be broadcasted live on the IDF Racing site tomorrow and as always follow our Instagram and Facebook for live updates- stay tuned! Photos courtesy of Khaleeq Alfred.